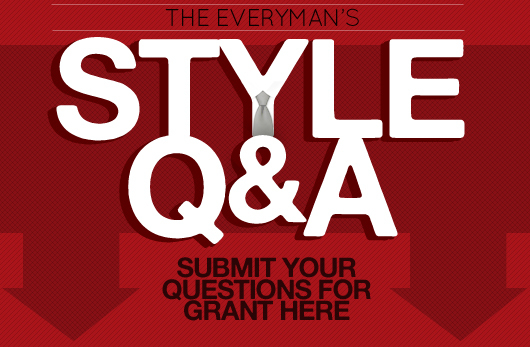 Professional style consultant Grant Harris answers your questions regarding pants that fit your thighs, a broader wardrobe than plaid shirts and graphic tees, how long your sleeves should be, and whether it's worth it to salvage a roomy leather jacket. 1. I can't seem to find any pants that fit me well. I have really slender thighs so most pants are incredibly too wide for me, even if the waist and length are perfect. Am I destined to make a trip to the tailor every time I buy pants? It sounds like you’re actually a good candidate for the slim fit trend that has been so pervasive over the last few years. I said slim, not skinny. Those jeggings and spandex-like pants aren’t what you need. You may be wearing relaxed, or loose fit trousers and jeans without knowing it. Study the brands you wear while shopping and ask the store associates which models offer a slimmer fit through the thigh. Most department stores and designers offer a loose or relaxed fit, a straight fit, and a slim fit. Make sure you’re wearing straight or slim and you should get a better fit. If all else fails hit the gym and do some squats to fill out your thighs. 2. I'm a 24 year old working student and can't seem to get past the plaid button up/graphic tee, Levis, and sneakers phase. I feel tired with that look, but not sure where I should turn to without falling into the all the trends and end up looking like all the rest. Any suggestions for originality on a budget? Unfortunately, you’ve already fallen into a trend. The good news is you’re ready for a new look. 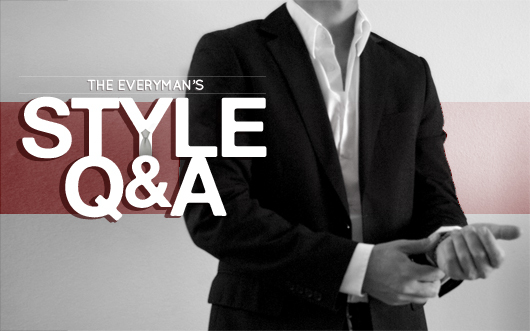 You may not be ready for suits and wingtips so the easiest transition for you will be gradual. Start with wearing the opposite of what you’ve been wearing. Burn the graphic tees and go for solids. Keep the plaid button ups but incorporate solids and stripes. 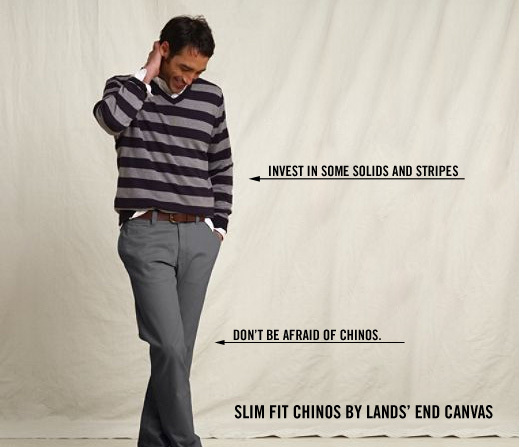 Save your Levi’s for the weekend and upgrade to chinos during the week. Sneakers are for relaxing and play time so invest in some footwear options you can’t wear on a basketball court like loafers, desert boots, and at least one pair of plain dress shoes. These small changes will make a world of difference. In your case change is good. Take a look at these shops for guys like yourself with limited funds. 3. I'm having trouble with sleeves. How long should sleeves be (shirt, sweater, suit jacket, and overcoat) and how big should the arm holes be? It’s agreed upon by many in the world of style and fashion that most men wear their jacket sleeves too long. Most guys walk around with their jacket sleeves covering their knuckles and end up looking vertically challenged. On the other hand most men wear the shirt sleeves too short. This is bad on top of worse. Shortening your shirt, jacket and coat sleeves will create the illusion of a longer arm therefore making you look taller overall. 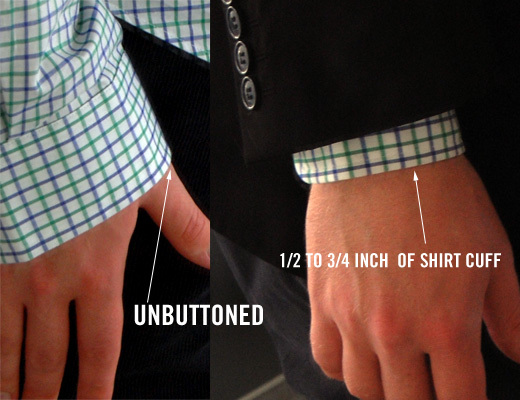 Your shirt sleeve should fall to the first bone of your thumb when unbuttoned. Your jacket and sweater sleeves should be short enough to allow 1/2 to ¾ inches –depending on how flashy you are–of shirt cuff to show when your hands are at your sides. Your overcoat should fit as well as your jacket. No shorter than your wrist bone and no longer than your first thumb knuckle. You bring up a good point about the arm hole. The width of the armhole and the sleeve itself plays a large role in keeping the overall silhouette slim and trim. You want a high armhole which will allow easier movement and provides space between your arm and your body creating a slimmer frame. Also you want the sleeves themselves to be narrow with minimal excess fabric. Ask your tailor to narrow the sleeves and you’ll knock ten pounds off your frame. 4. I've started to become more aware of the basics of fit and other fashion guidelines, and I'm realizing that my leather jacket is a bit large on me. I know that I really should have bought one that fit me in the first place but I was wondering if there was anything I could do. I've read online about washing leather jackets in warm water and there seems to be a bit of debate about it. I know conventional wisdom says it will ruin the jacket, but I’ve yet to really hear a reason behind that. Leather garments existed far before dry cleaning. Can I attempt to shrink it, or is this jacket a loss? There’s been a movement toward the distressed, worn-in, shruken feel in garments today. See J. Crew. It’s gone past shorts and t-shirts and has evolved to bags, and yes leather jackets. I like the idea of pre-distressed clothing, but when it comes to jackets and leather goods I prefer to break them in myself over time. I have a butter soft brown leather biker jacket I got in Italy back in 2007. It’s served me well and I can’t wear it without getting a compliment, but I broke it in on my own. A man in a broken-in leather jacket has a story to tell. Better to earn that story over time than to buy it up front at the store. However, you want to wash your jacket not to distress it but to shrink it. If this is your goal I say buy a new jacket. It’s good that you’ve been paying more attention to fit. Next time, pick a jacket that’s one size smaller than what you normally wear and it will probably be the best fit. Regarding 4. (and most advice given about “sizing down for a better fit”), what do you recommend for those that can’t size down, like myself? I generally wear a S (5’9″, 150lbs, 36 chest), but I sometimes find that even that size provides some swimming room in jackets. Many of my jackets fit on the looser side, and I’ve bought a few from American Eagle because their XS size fits me pretty well, but when many department stores don’t even size below M, it’s frustrating. Any advice? Stevo – I’d recommend you go for a straight or relaxed fit. I don’t think you’ll need a loose fit, but you should try different brands since the terms “relaxed” and “loose” vary from brand to brand. The same goes with your dress pants. Look for a straight fit which won’t hug your thighs. Instead they should provide more room while taking the attention off your lower half. There is no getting around tailoring. 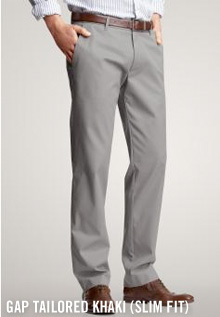 9 times out of 10 your pants will need to be hemmed and/or taken in or let out in the waist over time. This is a fact of nature and it is futile to fight it. Besides, your pants will fit better afterwards. Stevo – If this fails look into Bonobos. They offer a wide range of pants with a curved waistband and a bit of stretch in them to accommodate gentlemen like you with a larger lower half. This should solve the bunching fabric problem. I normally try to recommend products with 100% natural fibers, but extreme circumstances call for extreme measures. These should get the job done. Ryan – Are you talking about suit jackets or regular outerwear? This makes a difference. If your outerwear is too small and the size isn’t available in store you can ask the associate to have a smaller size ordered from the factory. The next option is to find jackets made in a slim fit. Many stores are providing this option past just shirting. Another option is to shop in the boy’s section. Boy’s sizes may actually be good for you. This may be a hit to your ego but it’s an option for your small frame. That brings us to your suit jacket. Most off the rack suit jackets come in 36 short at the smallest. If this is still too big check the boy’s section again. You’ll have to do research and find stores that carry XS sizes. AE is one but I think J. Crew is better. They carry extra small in almost all shirts, sweaters, and other tops. These are great tips. I think you nailed every one of them. I was stuck on item #2 for a long time and broke the trend by buying some of the new Dockers D2 and also some of the really really cheap J. Crew cords out there right now ($20). My style points have doubled since throwing out most of my jeans. I have a sizing question as well. I’m tall and relatively slim. I usually buy large shirts, but they are always too baggy around my chest & waist. I can’t size down to medium, because medium shirts are always too short. Even some of my large shirts are too short after a couple of washes (I try to not dry them too much to avoid this, but it doesn’t always work). Other than tailoring all my shirts, do I have any other options? Grant – my mistake, I meant in terms of outerwear. I have a few YXL shirts that fit pretty well (and that’s definitely my size of choice when it comes to sports jerseys), so no ego harm there, but I hadn’t really considered youth jackets. Might be worth a look. I’ll have to start checking out J.Crew a little more closely too, as my wardrobe evolves. Thanks. Also, I’d second Bonobos as a place to check out, Stevo. Billy – Thanks for commenting and congrats on your upgrade. Now take it to the next level! Collin- This is a common problem amongst taller men. The simple solution is to wear a slim fit shirt. In most cases a slim fit shirt will be up to 1.5 inches slimmer in the sides and chest than traditional or classic fit shirts. 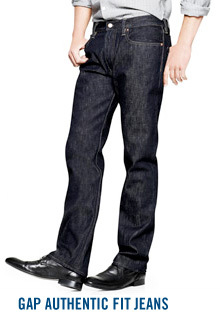 Most brand names carry a slim fit line these days. Be wary of the extra slim fit versions. You want a tapered fit but not tight. The buttons shouldn’t tug or pull or feel strained in the chest. If the buttons are stressed the shirt is too small. To address the shrinkage issue look for pre-washed and/or pre-shrunk garments. ALL cotton WILL shrink. It just depends how much. The only cotton that won’t shrink has been Sanforized, an old school process that prevents shrinkage but isn’t often used in department stores these days. If all else fails. Get to a tailor. Several of the questions targeted myself. I like your responses. 1. Those gap authentic fit jeans are a really good bet. I work at the gap and i do believe they are on sale right now. I just bought a pair during our 30% off clearance sale for $12.11. Not a bad deal at all. The price before the 30% was $15.99…still not a bad deal. Also, we have some slim fit cords(Khaki, Grey and Brown) that are 14.97, but if you go in and ask them to kill the price for you, you come out paying 7.97 for them..again, not too bad. Derrick, thanks for the tips! What is this “ask them to kill the price for you” you speak of? Is there a way of asking in such a way that the store will give you more of a discount? Well i know at the Gap, i’m not sure about Banana Republic or Old Navy, but if an item ends with .97 it’s called kill price. Which simply means it can be killed or reduced 50%. So if a shirt or pair of pants are..lets say 14.97 and you ask for them to kill it for for you and you could possibly get it for 7.97. Normally when people ask me to kill a price for them, i have no problem doing it. But it has to end with a .97. The only bad thing is, you can’t return or exchange it. So make sure it fits right before you ask. lets see, Gap normally does markdowns on tuesday evening, with the prices going to effect Wednesday morning, so the best times to go and check out the new kill priced items are going to be on Wednesdays. Outside of that i can keep you guys updated on when we have buy one get one free sales, and 30% off your entire purchase sales. Derrick, Great insight! That would be fantastic, thank you!